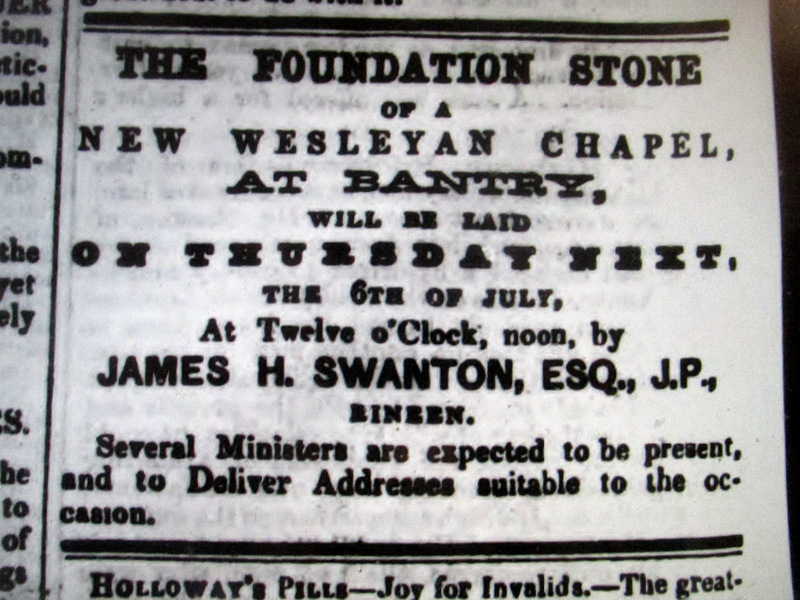 July 1865, Opening of Bantry Methodist Church, Co. Cork, by James Hutchinson Swanton, Esq., (O’Sullivan Descendant) J.P., Rineen Mills. The Church is a building of considerable architectural merit and is used as a medical centre. Swanton was a member of a family involved in milling, mining, business one of the partners was McNamara. After many of the local estates were sold off in the 1850s by the Landed estates Court the Swantons bought a considerable amount of land, later to be bought by the Land Commission and title give to tenants c 1905. The Swantons retired to Dublin to Carrisbrook House, Ballsbridge. James Hutchinson Swanton, 1815 – 1891, son of William Swanton, Ballydehob and Ms. Hutchinson, Clonee, Durrus. Her father, Hugh Hutchinson, landlord and Margaret O’Sullivan, Ballagahadown between Caheragh and Drimoleague. She is probably sister to Eugene O’Sullivan, Gent, middleman on a number of estates including Dunmanway Shouldham Estate. He is a church warden, Drimoleague c 1790. The Hutchinson major property owners in Bantry since at least mid 17th century. Not to be confused with Bantry Hutchins family. Slowly lands including Blackrock House now Bantry House acquired by Richard White (Ancestor of Lord Bantry). Estate sold Landed Estates Court 1850s. 1818 Rent charge 1818 Stephen Hutchinson of Kilveenogue (Bantry), and William Swanton, Gortnagrough, Schull, recited that Hugh Hutchinson of Clonee, Durrus, held farms house and lands at Letterlickey and other lands in Durrus. Hugh before his death in writing demised lands to Stephen his eldest son and heir a law subject to a payment of £600 sterling to Constance Hutchinson his daughter by Margaret Hutchinson otherwise O’Sullivan his wife and the like sum to each of his younger sons and daughters by said Margaret and that since the said Constance has married William Swanton and is now entitled to £600 and the lawful interest thereof since the death of Hugh which happened on the 12th day of June 1804 and making in the whole the sum of £762 and that said Stephen agrees to give said William Swanton a rent charge on that part of the land in Letterlickey in the occupation and tenancy of Florence Carthy and Denis Carthy his son for the sum of £107.7.6 until saidi Swanton and Constance are paid. The Church closed some years ago and is now used as a Medical Centre in excellent and condition.